SWISS has unveiled further details of its new Bombardier CSeries aircraft fleet, which it is acquiring for its European short- and medium-haul network. The attractive cabin interior and innovative new passenger seat were presented during the first visit to Zurich of the state-of-the-art new twinjet, of which SWISS is launching customer. SWISS expects to take delivery of the first of its new CSeries aircraft – in the CS100 version – in mid-2016. The first Bombardier CSeries aircraft to visit Zurich Airport – a CS100 – landed in Kloten yesterday (Wednesday) evening. The totally-new twinjet, which SWISS is acquiring for its European short- and medium-haul network, arrived on schedule at 19:16. To the delight of the many aviation fans who had turned up for the event, the landing was preceded by a low pass along the airport’s Runway 16, and was followed by a traditional “water salute” from the airport fire service and a special welcoming ceremony by a SWISS delegation. This morning saw the SWISS-liveried aircraft presented to officials, politicians and media representatives in the airport’s hangars. SWISS CEO Harry Hohmeister was joined by Fred Cromer, the President of Bombardier Commercial Aircraft and Ernst Stocker, President of the Canton Zurich Government Council, to formally welcome the new CSeries, which boasts particularly impressive low-noise, fuel efficiency and inflight comfort credentials. The arrival of the new CSeries between 2016 and 2018 will also add over 150 new positions to the SWISS workforce, and will give SWISS one of the youngest European fleets. SWISS also used the occasion of the new Bombardier CSeries’s first visit to Zurich to unveil details of the new twinjet’s interior in the SWISS design. The prime features here include a bright and appealing cabin and enhanced travel comfort through more generous space, lower noise levels and the innovative new seats from manufacturer ZIM. All the details of the new SWISS Bombardier CSeries – including its cabin interior – are also available in the “World of SWISS” online experience at www.world-of-swiss.com/en/cseries. These webpages will also be regularly updated, enabling visitors to follow the entire arrival process for the new Bombardier CSeries fleet. The visiting CS100 will be leaving Zurich tomorrow (Friday) morning. 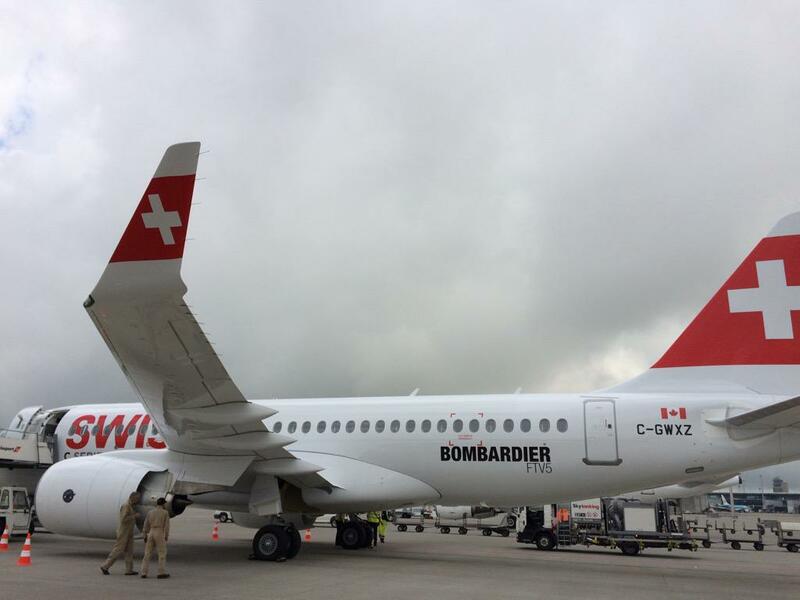 SWISS is both launching customer and first operator of the Bombardier CSeries, and expects to receive its first deliveries of the new twinjets in mid-2016. SWISS has ordered 30 CSeries aircraft in total. Ten of these will be CS100s, and ten will be the larger CS300. The versions for the final ten aircraft will be decided at a later stage. In addition to the World of SWISS site, extensive media documentation on the new Bombardier CSeries will be found at http://www.swiss-cseries.com/en/ from 19 June onwards.